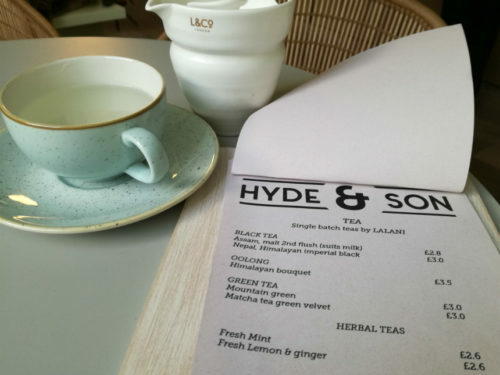 At temperatures hovering around zero, a freshly whizzed veggie fruit juice is never going to hit the spot, but this bottomless cup of fresh lemon and ginger tea at Hyde and Son at the west end of George Street definitely did. Priced at £2.60 you get a pale green, gold rimmed cup with slice of fresh ginger and fresh lemon, topped with boiling water and a lid to keep the heat in. Once cooled to drink and drunk, the staff will happily refill – so sit quite near the bar – for speedier water replenishment.